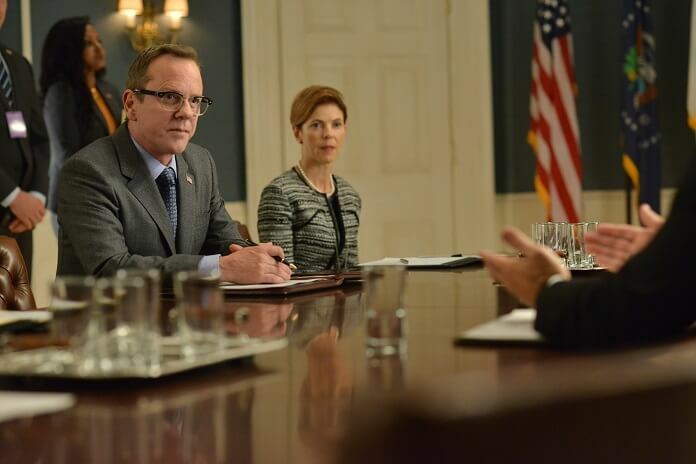 “I’m tired of you people always telling me my hands are tied,” yells President Kirkman (Kiefer Sutherland) to his staff after they try to tell him he only has one option in dealing with the current Turkish government in season two episode seven of ABC’s political thriller series, Designated Survivor. As the episode begins, there’s an activist rally at the Turkish Embassy due to the conflict between the Turkish President and an activist leader. If the activist gets sent back to Turkey, he’ll most likely be executed as a rebel. Over at the FBI, Agent Hannah Wells (Maggie Q) and Damian Rennett (Ben Lawson) are questioning Thorne’s assistant about Secretary Moss (Geoff Pierson) visiting Thorne hours before she was murdered. She reveals that Moss and Thorne were having an affair. Over in the Oval Office, the President’s son, Leo (Tanner Buchanan), is giving his new girlfriend, Cybil, a tour when his dad arrives and welcomes Cybil to the White House. She’s taken by surprise to be meeting the President and excuses herself to use the restroom. After she’s gone, Leo tells his dad he’s late. Tom apologizes saying he got held up with work. (It seems Tom planned on Tom walking in on Cybil to impress her for Leo). The First Lady (Natascha McElhone) and her mother, Eva (Bonnie Bedelia), are going over her upcoming testimony with FBI Director John Forstell (Reed Diamond). Alex and the White House Council (Zoe McLellan) encourage her not to offer up any extra information and to try to steer clear of the fact she met with Little a few weeks ago. During a live press op, Turkish President Fatih Turan (Troy Caylak) goes off script and says America and its president are harboring an enemy and terrorist of the Turkish government. After quickly wrapping up the press op, Kirkman meets privately with the President Turan who tells Kirkman he wants the activist rebel seeking asylum in the States to be handed over to his country to exact justice. Kirkman assures Turan the man had no part in any bloodshed and is now a teacher in the United States. Turan is not pleased and vows to take it up during the NATO talks. Aaron (Adan Canto) meets with Kirkman to tell him Moss is now a Person of Interest in the murder of Charlotte Thorn. Kirkman can’t believe Moss would murder anyone, having been president once himself. Plus, he was so supportive and helpful to Kirkman. Kirkman gives the go-ahead for the FBI to pursue their lead but with discretion. Leo is escorting Cybil home when they get approached by a protester who gets in Cybil’s face about not joining the protest. Leo, being protective, pushes him away from her. It comes out later that it was caught on video and now the protestor is suing Leo. Over at the FBI, Wells and Rennett try to interview Moss but he refuses to cooperate and walks out, insulted. At the mini-NATO meeting, the Turkish President isn’t able to talk about his agenda regarding the teacher he wants shipped to Turkey so he decides America is not interested in Turkey’s best interests. He threatens to leave NATO and possibly team up with Russia. A reporter named Gimble approaches Seth (Kal Penn) and tells him she wants an interview with the President about the investigation into his mother-in-law or she’ll publish what she has without the President and his family’s side of the issue. Seth tells the President who is warned by the rest of his staff that if he misspeaks or mentions something different than his mother-in-law says during her questioning, it could lengthen the investigation. “NATO is falling apart, my son is being sued, my mentor is a potential murder suspect, and my mother-in-law is being grilled by the FBI. I’m sitting here watching the world burn. It’s time to pick up a bucket. Set up the interview,” says Kirkman. In her office, Emily (Italia Ricci) questions Moss who’s more forthcoming with her and admits to having an affair with Thorne but swears he didn’t kill her. Emily asks him where he was when she died and why he checked into a clinic the next day, but he refuses to answer insisting it’s not relevant. Having no other option, Emily tells Moss he’s suspended from his duties until the investigation is over and his name is cleared. Moss handles it with grace and says he looks forward to returning once his name is cleared. In a set of well shot and well paced scenes, Kirkman gives his interview with Gimble at the same time his mother-in-law is being questioned by Forstell. Both do extremely well but the last question Forstell asks Eva is about a vacation she took with her daughter. She answers confirming she took the vacation and paid for it out of the money left to her by her husband. Aaron does some digging and discovers that Cybil, Leo’s girlfriend, is in on the civil suit. It seems she’s a plant from the man who Leo pushed and that the man was in fact hired by a group working for…wait for it…the Turkish President. Aaron informs Kirkman who explodes, furious the man came after his family. He tells his staff to demand Turan come to the White House immediately. Back at the FBI, Wells and Rennett are going over the evidence again and realize the friendship ring Moss gave to Thorne was not on her body when it was discovered. After having Chuck Russink (Jake Epstein) go through multiple photos of the night before she died, they see the ring on her and realize they have seen it on someone else. Wells and Rennett return to question Thorne’s assistant about it and see she’s still wearing the ring. The assistant breaks down and admits she killed Thorne because she was in love with her but finally realized she didn’t love her back. Back at the Oval Office, Kirkman meets with Turan telling him he plans on having a press conference parading around the teacher he so desperately wants back in his country. He adds that he’ll inform the American people and the world that the teacher should be the next President of Turkey and that he has his support 100%. Tarun freaks out, saying the President can’t do that. Kirkman promises him he will make sure that his country is in a civil war unless Turan does exactly what he tells him to do. The lawsuit against his son goes away, Turkey stays in NATO, and no more problems with trade agreements. Kirkman finishes by telling Turan that if he ever tries to harm his family in any way again, he will find him – not as the President but as a man trying to protect those he loves. “I promise you, that’s not how you want to see me,” finishes Kirkman. Turan leaves the office with his tail between his legs. Later, Moss meets with President Kirkman and apologizes for his behavior. He admits the night before Thorne was killed, she broke it off with him because he would not commit to marrying her. He fell off the wagon that night and the next day checked himself into a clinic to dry out. Kirkman is a little upset Moss felt he couldn’t come to him with this and tells him he can’t keep him on the outs of something like that in his life again. Moss says he won’t and tries to resign, but Kirkman refuses to accept it telling him the country needs him and that the President still needs his counsel. The scene ends with Tom telling Moss to go take care of himself and that his office will be waiting for him when he’s ready to come back. Over at Wells’ apartment, Rennett shows up and they ‘get together.’ Afterward, Rennett tells Wells he has been transferred to the British Embassy for good. The episode ends with Alex telling Tom she has been subpoenaed by Forstell. It seems an account was set up in her name at the vacation spot she went to with her mother. “I’m being set up. We’re all being set up,” says Alex. Dramatic and crammed with one too many storylines, episode seven titled “Family Ties” moves the political thriller once again into the category of political melodrama with outrageous coincidences, a quick and disappointing resolution to Thorne’s murder, and an uninteresting scandal that’s being dragged out. Missing is the urgency of diplomatic matters and the safety of the country. The stand-out performance once again goes to Kiefer Sutherland as President Kirkman who finally tells off his staff and orders them to do what he thinks is best on how to handle the Turkish President and the chaos he has created. The scene where Kirkman calls out Turan and promises him a civil war in his country if he doesn’t cease and desist his actions is the best scene in the episode. It once again shows the strength and wisdom Kirkman has as leader of the free world. Just because he’s a man of morals, ethics, and family values doesn’t mean he doesn’t know how to fight back and win. With the First Lady being set up and the President’s Secretary out on personal leave, it looks as though life is going to get even more difficult for the Commander in Chief.